It's Never2Late was founded in 1999 and is dedicated to helping older adults lead fuller lives. It is a computer therapy program that is built on a picture-based, touch-screen interface that allows users to simply "touch" their way to find educational, spiritual and personalized content that is appropriate to their own level of ability. This program allows our residents to enjoy mind-stimulating activities, improve hand-eye coordination as part of our rehabilitation program and provides a wide range of programs for the development and continuation of our residents' physical and cognitive ability. A major focus of this program has been developing engagement tools for older adults dealing with dementia and other cognitive disorders. 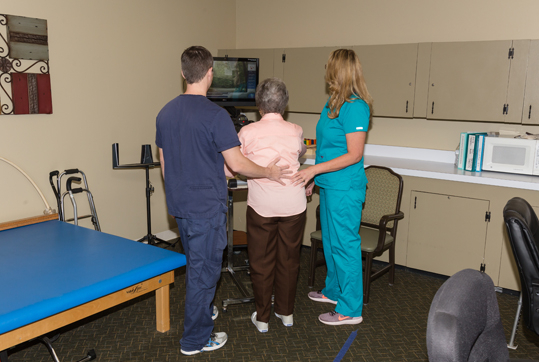 Therapy-specific programming and clinically intuitive layouts allow therapists to see positive outcomes with residents, regardless of their physical or cognitive abilities. Through research and real-word examples it has been found that using computers and other technological solutions for therapeutic intervention helps residents sustain treatment for longer, more thorough treatment sessions while keeping them engaged and having fun. With the massive amount of content available, rehabilitation professionals are finding new ways to engage and treat clients with dementia and cognitive decline. Please feel free to contact our administrator at 318.445.8343.